On May 7, 1940, the House of Commons began perhaps the most crucial debate in British parliamentary history. On its outcome hung the future of Prime Minister Neville Chamberlain's government and also of Britain -- indeed, perhaps, the world. CBI - China: Day 20 of 154 of the Japanese Invasion of Manchuria. Spain: Day 83 of 985 of the Spanish Civil War. Spain: Day 448 of 985 of the Spanish Civil War. CBI - China: Day 93 of 2,987 of the 2nd Sino-Japanese War. Day 56 of 106 of the 2nd Battle of Shanghai. Day 37 of 70 of the Battle of Taiyuan. Spain: Day 813 of 985 of the Spanish Civil War. CBI - China: Day 458 of 2,987 of the 2nd Sino-Japanese War. Day 119 of 139 of the Battle of Wuhan. CBI - China: Day 823 of 2,987 of the 2nd Sino-Japanese War. Day 25 of 26 of the 1st Battle of Changsha. The Japanese begin withdrawing from this region. ETO - UK: Day 32 of 258 of the Blitz. ETO - UK: Day 90 of 114 of the Battle of Britain. Romania: German troops enter Romania to 'help restrain the Army'. East Africa: Day 120 of 537 of Italy's East African campaign in the lands south of Egypt. CBI - China: Day 1,189 of 2,987 of the 2nd Sino-Japanese War. Day 328 of 381 of the Battle of South Guangxi. CBI - Thailand: Day 7 of 221 of the Franco-Thai War (Vichy France vs Thailand). Russia: Stalin lifts his ban on religion in effort to boost morale. Russian Front - Finland: Day 101 of 142 of Operation SILVER FOX, a joint German-Finnish campaign to capture the Russian port of Murmansk in the Arctic. Russian Front - Finland: Day 99 of 140 of Operation ARCTIC FOX, a joint German-Finnish campaign against Soviet Northern Front defenses at Salla, Finland. Russian Front - Finland: Day 108 of 164 of the Battle of Hanko. The Soviets will be forced off their leased naval base. Finland rejects a British demand to cease fighting the Soviet Union. Russian Front: Day 108 of 167 of Germany's Operation BARBAROSSA. Russian Front - North: Day 30 of 872 of the Siege of Leningrad. Russian Front - Center: Day 6 of 98 of the Battle of Moscow. The German advance on Moscow continues with the capture of Vyasma. Russian Front - South: Day 61 of 70 of the Siege of Odessa, Ukraine. Russian Front - South: Day 12 of 12 of the Battle of the Sea of Azov (north of Black Sea). German Army Group South concludes the battle along the Sea of Azov and takes 100,000 prisoners. MTO - Libya: Day 181 of 256 of the Siege of Tobruk. East Africa: Day 485 of 537 of Italy's East African campaign in the lands south of Egypt. CBI - China: Day 1,554 of 2,987 of the 2nd Sino-Japanese War. Day 32 of 33 of the 2nd Battle of Changsha. The Japanese begin retreating from this region. Russian Front - North: Day 395 of 872 of the Siege of Leningrad. Russian Front - North: Day 156 of 658 of the Siege of the Kholm Pocket, USSR lays siege to the Kholm Pocket but the Germans hold out for a about a year and a half. Russian Front - South: Day 102 of 150 of Germany's CASE BLUE, the failed offensive to take the Caucasus oil fields. Russian Front - South: Day 46 of 165 of the Battle of Stalingrad, bloodiest battle in human history. MTO - Egypt: US warplanes provide air cover the battle area west of El Alamein. MTO - Greece: US B-24s hit a tanker and 8 fuel installations at Suda Bay, Crete. East Africa: Day 156 of 186 of the Battle of Madagascar. CBI - China: Day 1,919 of 2,987 of the 2nd Sino-Japanese War. PTO - Alaska: Day 123 of 435 of the Battle of Kiska, Aleutian Islands. The US and Canada will defeat the Japanese invaders. PTO - Malaya: Day 231 of 357 of the Battle of Timor Island, a long guerrilla war ending in Japanese victory. PTO - New Guinea: Day 79 of 119 of the Battle of the Kokoda Track. The Australians continue pushing back the Japanese troops. PTO - Solomon Islands: Day 62 of 187 of the Battle of Guadalcanal. PTO: The Japanese execute 98 American POWs on Wake Island who had been kept there as forced laborers since the island was taken on 23 Dec 41. The small number of Americans defending Wake Island on 07 Dec 41 gallantly and successfully fended off several attacks until overwhelming Japanese numbers finally took the island on 24 Dec 41. 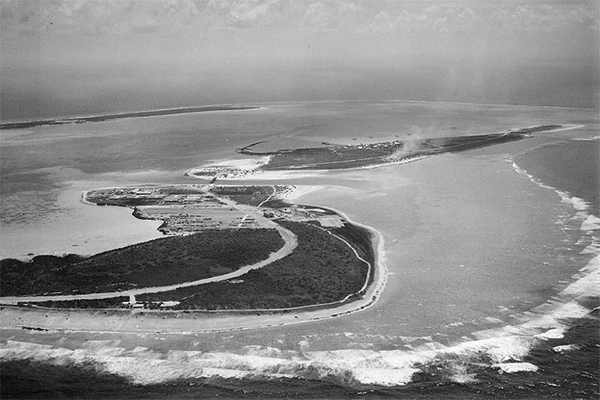 The Battle of Wake Island became known as the Alamo of the Pacific. Most of the Americans left alive after the battle were taken by the Japanese off the island to POW camps elsewhere. The 98 remaining behind, mostly civilian contractors, were used as forced laborers to continue to build defensive fortifications on the island, but now for their Japanese captors. But on 07 Oct 43, Rear Admiral Shigematsu Sakaibara, commander of the Japanese garrison on Wake Island, ordered the execution of all 98 Americans there, claiming they were trying to make radio contact with US forces. The execution of those American POWs, who were blindfolded and shot in cold blood, remains one of the more brutal episodes of the war in the Pacific. One of the prisoners (whose name has never been discovered) escaped the massacre, apparently returning to the site to carve the message 98 US PW 5-10-43 on a large coral rock near where the victims had been hastily buried in a mass grave. The unknown American was recaptured, and Sakaibara personally beheaded him with a katana. 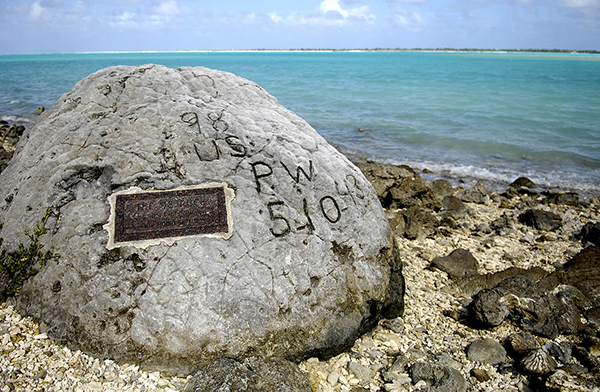 The inscription on the rock can still be seen and is a Wake Island landmark. If you're confused about the date "5-10-43" carved on the rock versus our 07 Oct 43 date for when the massacre took place, then join the club. Add to the confusion the fact that a typical American date would have been carved "10-5-43" (month-day-year). Perhaps the unknown American escaped the massacre by hiding on the 5th. After all, his carving makes no mention of the massacre, just the number of prisoners. Or maybe after nearly two years of captivity, the prisoners had lost track of what the date was. It's doubtful that the Japanese issued them a new calendar each year. ETO - Germany: The RAF bombs Stuttgart, making use of the Airborne "Cigar" jamming device, killing 1,700 and making 18,000 homeless. Russian Front - North: Day 760 of 872 of the Siege of Leningrad. Russian Front - North: Day 521 of 658 of the Siege of the Kholm Pocket. USSR lays siege to the Kholm Pocket but the Germans hold out for a about a year and a half. Russian Front - North: Day 12 of 15 of the USSR Kremenchug Offensive into Estonia. Russian Front - South: Day 45 of 122 of the Battle of the Lower Dnieper River, USSR. MTO - Italy: The US 5th Army is halted by the German defenses along River Volturno, 20 miles North of Naples. The RAF and US 12th Air Force provides air support for Allied ground troops. 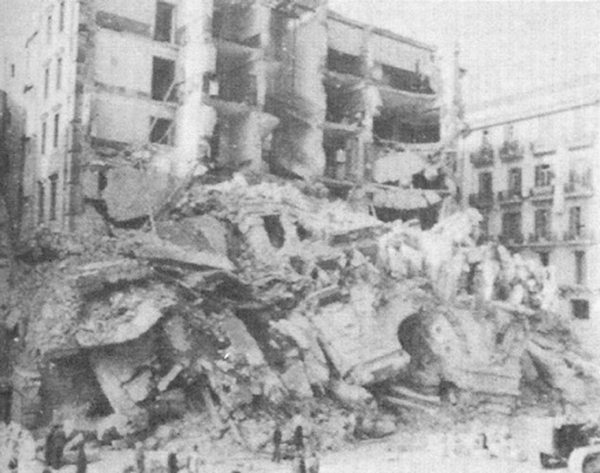 MTO - Italy: A massive time bomb planted by retreating Germans in the Naples Post Office explodes, killing or wounding up to 100 civilians and servicemen. The massive time bomb was planted behind a cleverly designed false wall in the basement of the Naples post office, just 300 yards away from the 82nd Airborne's Divisional Headquarters at the Questura across the city's square. At around noon on 07 Oct 43, it detonated. A huge explosion tore through the building and rocked the entire square. Everyone nearby felt the shockwave of the blast and rushed over and pitched in to give aid to the wounded and to dig out the grisly remains of the dead. The Germans had routinely left booby-trap devices behind them whenever they were forced to retreat. In this instance, they had correctly assumed that the building would soon be used by Allied troops and they had set a delayed timer to go off when many men might be gathered there for lunch. With some success, British and American engineers had been frantically checking for time bombs and booby traps ever since they entered Naples on 01 Oct 43. In one building they found a device attached to 1,700 pounds of TNT. They defused it just a few minutes before it detonated. Despite their herculean efforts, the post office explosion was followed on 10 Oct 43 by another bomb blast in the former Italian Artillery Barracks where the 307th Airborne Engineer Battalion and a company of engineers from the 36th Division were quartered. This bomb exploded at 8:30 am on the southern side of the barracks. Many of the troopers were still asleep. Twenty-three men were killed and 21 more were wounded. CBI - China: Day 2,284 of 2,987 of the 2nd Sino-Japanese War. PTO - New Guinea: Day 19 of 219 of the Battle of Shaggy Ridge. PTO - New Guinea: Day 16 of 162 of the Battle of the Huon Peninsula. Will result in an Allied victory. PTO - Solomon Islands: Day 54 of 56 of the Battle of Vella Lavella. ETO - France: Day 68 of 284 of the Battle of Brittany. ETO - Belgium: Day 36 of 62 of the liberation of Belgium. ETO - Belgium: Day 6 of 38 of the Battle of the Scheldt Estuary. ETO - France: Day 23 of 236 of the Siege of Dunkirk. ETO - Germany: Day 19 of 145 of the Battle of Hürtgen Forest. ETO - Germany: US 8th Air Force B-17s and B-24s fly maximum effort in Germany. ETO - Germany: A revolt by Jewish slave laborers at Auschwitz-Birkenau results in complete destruction of Crematory IV. Russian Front - Finland: Day 23 of 223 of the Lapland War. Finland and Russia have joined forces to kick the Germans out of Finland's most northern province. Russian Front - Finland: Day 1 of 23 of the Petsamo-Kirkenes Offensive. The Soviets will drive the Germans out of the Arctic region in northern Scandinavia. German 20th Gebirgsjager Army retreats toward northern Norway in the face of strong Soviet attacks. Russian Front - North: Day 24 of 41 of the Battle of Riga, Latvia. Russian Front - Center: Day 24 of 72 of the Battle into East Prussia and northern Poland. Russian Front - Center: Day 3 of 18 of the Battle of Memel, a border town of Lithuania and East Prussia. Russian Front - South: Day 2 of 24 of the Battle of Debrecen, Hungary. Russian Front - South: Day 24 of 72 of the Battle of Belgrade, Yugoslavia. MTO - Italy: The British 8th Army resumes its attacks on the Gothic Line. The RAF and US 12th Air Force provides air support. MTO: US 15th Air Force B-17s and B-24s bomb oil refineries in Austria while others drop on Hungary. 6 B-17s evacuate downed US airmen from Czechoslovakia to Italy. MTO - Greece: British troops reach Corinth, land at Nauplion and take the island of Samos. CBI - Burma: Day 190 of 302 of the Chinese Salween Offensive in Burma. CBI - China: Day 2,650 of 2,987 of the 2nd Sino-Japanese War. Day 174 of 259 of Japan's Operation ICHI-GO. PTO - New Guinea: Day 298 of 597 of the Battle of New Britain. PTO - New Guinea: Day 169 of 481 of the Battle of Western New Guinea. PTO - Palau Islands: Day 23 of 74 of the Battle of Peleliu (Operation STALEMATE II). PTO - Palau Islands: Day 21 of 36 of the Battle of Angaur. Over 1,000 depression-era civilian contractors came to remote Wake Island in 1941 to build an air station only to find themselves in the Alamo of the Pacific. Pulitzer Prize winning chronicle of one of the most vibrant and revolutionary periods in the history of the United States and an intimate portrait of Eleanor and Franklin Roosevelt during a time in which a new, modern America was born.